As a marketing leader you know that each customer experiences numerous touch points with your company throughout their lifecycle. And it’s the job of marketing to ensure that each interaction has a positive impact and moves the customer on to the next stage. But how can you measure the success of your combined efforts and their impact on your customer’s lifecycle? After all, you’re doing more than generating awareness. 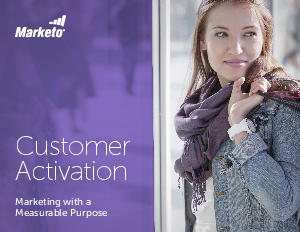 It's time to think about Customer Activation. Customer Activation means motivating customers to move to the next stage of their lifecycle faster than they would on their own. But, how to you activate your customers when you’re interacting with millions?